Ekiti State Governor, Ayodele Fayose has accused the state Commissioner of Police, Abdullahi Chafe of shielding an alleged killer customs officer. But the CP, in a swift reaction, denied the allegations. It was gathered that the unidentified customs officer rammed his car into a shop in Ayetoro Ekiti in Ido-Osi local government area and killed two people on the spot while a few others were injured. Those who lost their lives in the accident were Emmanuel Owaremi and Mrs. Titilayo Omotoso, while another victim, Bukola Aboko, lost her five months pregnancy in the accident and also sustained bodily injury. It was also gathered that the police after rescuing the man and another female occupant of the car from the scene of the accident, released them without charging them to court. Unhappy at the action of the police, aggrieved residents of the community stormed the police station to demand the re-arrest and prosecution of the killer driver. Some of the family members of the victims were subsequently arrested and charged to court for breaching public peace and for attacking the police station. 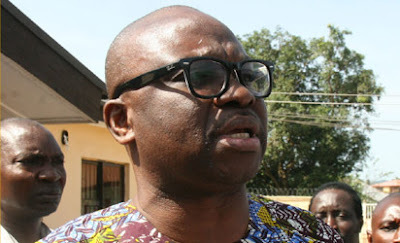 A spokesperson for the two families, Adeola Abiodun said “We were made to write the letter under duress and we had no choice because we were constantly harassed by the police.” Fayose, who spoke with journalists after the protest, said he was saddened by the weighty allegations against the police. He lamented that the Commissioner of Police could not give a satisfactory answer when he was confronted with the facts of the case. He said: “I am saddened by this development. Those who are supposed to be protecting us shouldn’t be oppressing us.